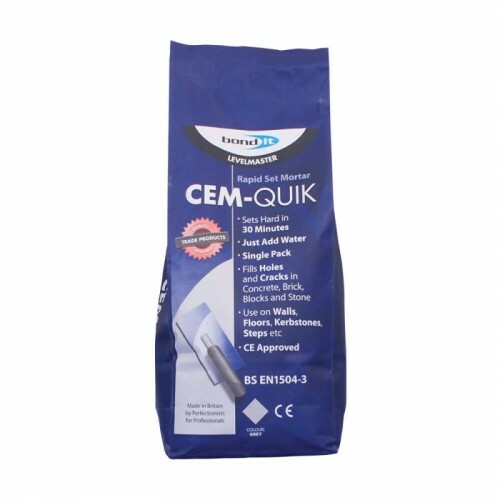 A cement based patch repair product which is simple to apply and sets hard in approximately 30 minutes. For internal and external repairs to most masonry substrates; for gap and crack filling, jointing and sealing earthenware pipes and drains, patching steps and windowsills, setting and bedding WC's, sinks, railings and posts. Fills holes and cracks in concrete, brick, blocks and stone. Sets in the cold and wet. CE Approved: Conforms to EN1504-3. Add water and mix to a smooth mortar. Apply using a trowel or filling knife. Can be applied up to a thickness of 25mm.